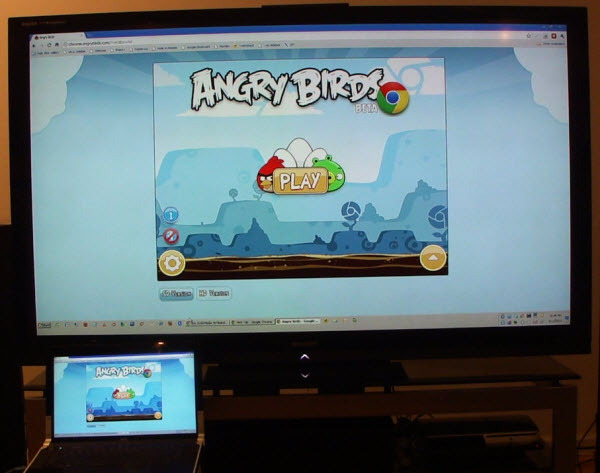 After today’s announcement that Angry Birds was released in the Chrome app store I just knew I had to try running it on my new Sharp 70″ LCD TV (model LC-70LE732u). I recorded a video to show this. Unfortunately even the HD version of Angry Birds doesn’t go full screen to take advantage of the full 1920×1080 resolution of the TV. I think I may also now hold the distinction of being the first person to run this on such a large LCD TV. The Sharp is a great TV that costed less than every 65″ LCD that was on the market when I purchased it and is fully LED backlit as opposed to most that are only LED edge lit. I’m really happy with it and highly recommend you research it if you’re in the market for a large LCD TV. Here’s a great thread on the very popular AVS Forum if you want to learn more about it. Thank you for showing such a amazing video , it will really attracts many peoples. The Sharp is a great TV that costed less than every 65″ LCD that was on the market, I’m really happy with it and highly recommend you research it if you’re in the market for a large LCD TV. Hi,Its very nice article.The video clip in this articles are very nice and very helpful for attracting many peoples.Its great size available in the market is 65″ LCD with best picture quality.Its very nice design.Keep it up. Well written article.I will appreciate your writing skills.Its great.This is an informative & impressive article. I enjoy at the time of reading this article .I like this.Keep update your blog.